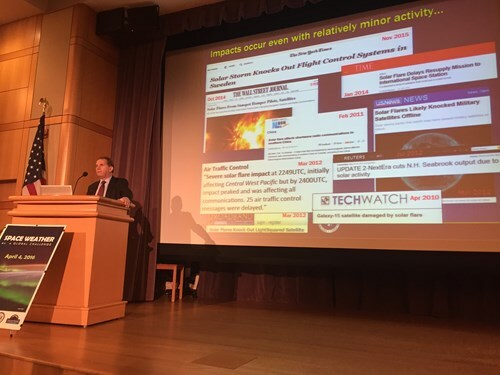 May 2, 2016 – On April 4, 2016, SWF and the U.S. Department of State co-hosted an event that brought together top space weather experts to discuss the international aspects of the recently National Space Weather Strategy and inform policy makers of the potential impacts of space weather on infrastructure and the global economy. The event attracted over 130 participants, representing 30 countries. Leadership from across the U.S. government – the White House Office of Science and Technology Policy, the Department of State, the Department of Homeland Security, the National Oceanic and Atmospheric Administration, the National Aeronautics and Space Administration, and the U.S. Air Force – described space weather-related programs and efforts to improve coordination and messaging to meet the goals of the strategy. Moderated by SWF Project Manager Laura Delgado López, an international panel with speakers from the United Kingdom Met Office, the European Space Agency, the World Meteorological Organization, the North Atlantic Treaty Organization and the United Nations Committee on the Peaceful Uses of Outer Space, discussed international coordination and cooperation efforts to improve shared understanding of and resilience to space weather events. Event materials, including presentation files and background materials, are available on the event page. Videos of the presentations will be made available soon.